Ostia was excavated until 1941 on a large scale, but many areas were never scientifically documented until today. Pavements were rarely recorded, even though there are relatively adequate plans of walls. Detailed plans exist only regarding high value floors like figured mosaics, not ordinary floors like simple mosaics, mortar beds, travertine and even marble pavements. The situation is even worse regarding plazas, with prominent examples like the Forum (see picture below), which were never documented in detailed plans showing individual pavement slabs and the various traces of use and reuse. 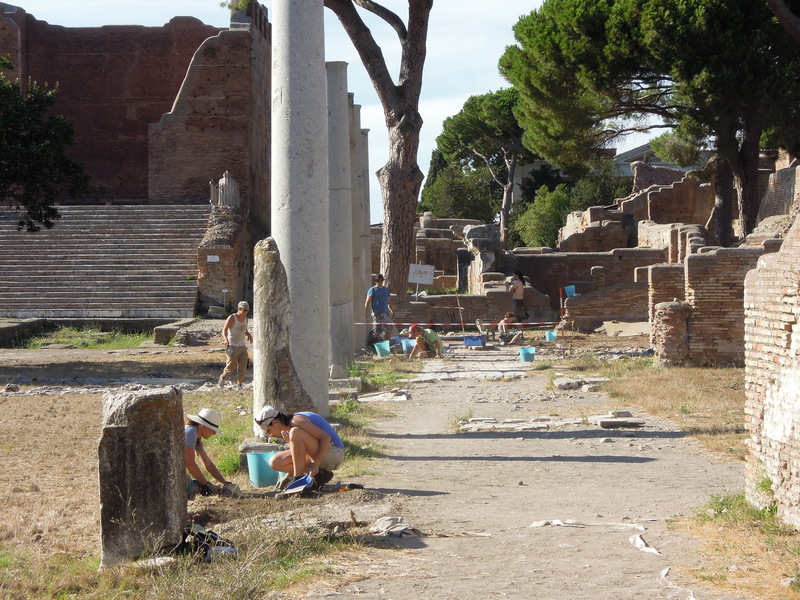 The main aim in a city like Ostia, which had a very problematic excavation history, especially due to the large scale excavations from 1938 until 1941 with almost no stratigraphical information recorded, is to do maximal detailed recording with minimal invasive excavation work. Therefore, we started from the first project in 2002 – and continue until today – with the idea to clean the micro-stratigraphy inside and underneath the modern vegetation layers with maximum care. This allowed us to gain a similar situation like it appeared to previous excavators in order to do the documentation, which was not done in detail from the early 19th century until the mid-20th century. After removing the recent vegetation and touristic occupation layers, we found a partly very uneven antique surface, which was a product of centuries of robbing activities and the almost pre-scientific excavation methods used in the 1930’s. Fortunately in some areas we can rely on the excellent plans of Italo Gismondi executed before 1938 and the diaries of Raffaele Finelli until 1924. Ostia, and especially its centre, is a very attractive touristic site. The negative side-effect of this attractivity is a largely uncontrolled flow of visitors, who walk directly on top of previously unrecorded antique surfaces. i) Archaeological surface cleaning. Our first aim was to do large scale surface cleaning to find out where previously unrecorded pavements have survived. As side-effect, we were able to trace and localise former undocumented excavation activities and define their extents. In the vegetation layer, we found a surprisingly rich stratigraphy from post-antique occupation layers to middle age robbing pits and further on to 19th century early scientific excavation-activities ending with recent tourist trample and rubbish dumps. ii) Geophysical analysis. 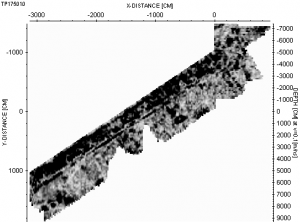 Our second aim was to do large scale geophysical analysis from 20 cm depth until 160 cm depth to find out where substantial remains of buildings can be detected and where areas of refill and previously undocumented excavations were situated. iii) Documentation of all antique surfaces. Based on surface cleaning, we tried to document all surface-evidence of surviving late antique stratigraphy and pavements. iv) Strategical stratigraphical-sondages. Based on geophysical analysis, our aim was to plan strategical fundamental sondages. By defining the limits of the previously undocumented excavation work until the 1950’s with help from old photographs, diaries, and the geophysical plans, it was possible to do minimal invasive excavation work. Trenches deeper than 30 cm were executed in previously excavated refill areas, with the purpose of cleaning and draw profiles in the status quo of the excavations from the late 19th and early 20th centuries. v) New documentation methods. 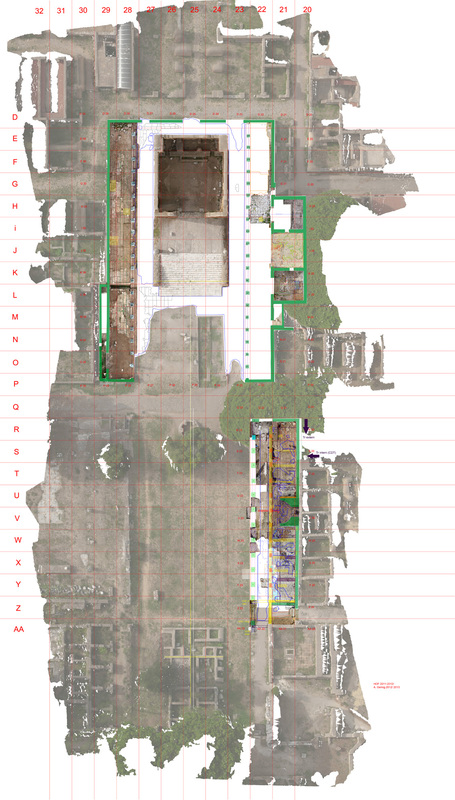 New methods were developed to document previously unrecorded large-scale surfaces of plazas and buildings. Firstly, this regards the two-dimensional photo-mosaics with highest resolution digital photography. Secondly, three dimensional recording methods were used. That is 3-D laserscannings with colour infor mations and 3-D ortophotography with the aim to get point clouds of different resolution for wall painting, graffitti, and minimal surface traces on one hand, and large-scale brickwalls on the other hand. In order to document large areas in limited time we developed a complete digital recording system based on aerial photography with quadro- and octo-copters and supplementary high resolution photography from the ground. vi) Grid system and coordinates. In order to put these 3-D-model plans into a broader framework, a basic grid had to be established for the entire centre of the city. Because of the dominant orientation of all standing walls along the Decumanus, our grid system does not rely on the magnetic north, but on site-north, which is defined by the northern Cardo. This grid will be geo-referenciated with world-coordinates. 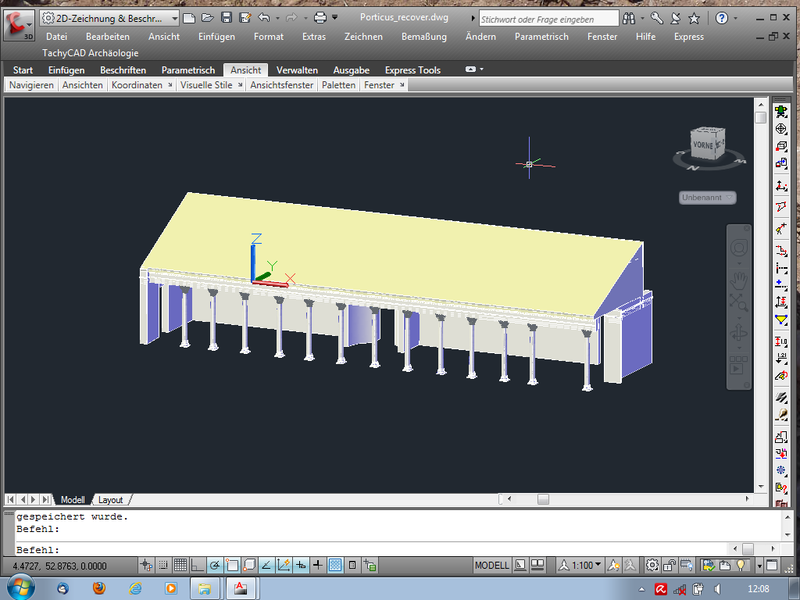 vii) 3-D reconstructions. Based on the point clouds and all available stratigraphical informations, the final aim of the project is to create 3-D reconstructions of all building phases of the city centre from the 3rd century BC to the 6th century AD. In comparison to existing 3-D models, we aim to develop a more precise differentiation between the original antique remains, modern conservation efforts and actual damage by erosion, and the hypothetical full reconstruction of its supposed antique shape. – Axel Gering. 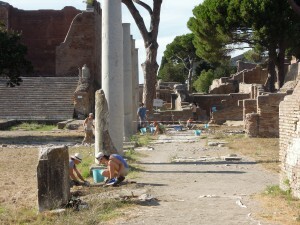 Ruins, Rubbish dumps and encroachment: Resurveying Late Antique Ostia. In: L. Lavan and M. Mulryan (Eds.). Fieldmethods and Post-Excavation Techniques in Late Antique Archaeology, LAA 9, 2012 (Leiden 2013). Page 249-288.